We started the week by laying down class agreements, attendance expectations, and assessing our strengths and how we can use them to support our learning. Overall I was delighted by the thoughtfulness and excitement of our first day. Initially, I was disappointed we didn’t dive right into more technical topics but by the end of the day I felt relieved that establishing a supportive learning environment was treated so seriously. On the second day we claimed a strength for ourselves and for the benefit of our cohort. I enjoyed reflecting on the contributions I could make to our group beyond code. After reviewing my strengths test results I claimed the strength of learning and told my comrades they could count on me to encourage and support their learning. I hope this blog will help others as they learn to code or learn to teach coding (two different skills!). I had prearranged to miss some class midweek and I was feeling nervous about catching up but I think I was able to with some one-on-one help and helpful notes. Although every now and then I come across a bash shortcut I didn’t set up or something else I am still not grasping and I ask myself “Did I miss something?” It’s a good thing I am learning to be more comfortable with confusion. I am surprised by how conceptual much of our learning has been so far. 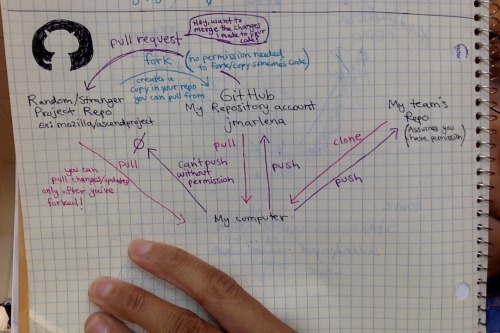 For instance, how Git works is so much more than learning the commands in the Terminal. The pacing of new material sometimes feel slow (even if I am not caught up) but there’s so much to learn in using Git and Vim that I feel like we could spend 6 weeks on just learning the ins and outs of these programs. Git Immersion is a helpful tutorial we used for setting up Git in the Terminal. By the end the week we held a Maker Party, where we presented on different Web Literacy topics and then made a web page, GIF, etc. for the web using Web Maker tools. I learned more about privacy, the filter bubble and Net Neutrality to name a few topics. Web Maker has lots of resources and tools to teach web literacy. I am excited about using this site as a learning resource and I’d like to organize a Maker Party at some point. Here’s a clip I edited from my favorite Russian animated film “The Hedgehog in the Fog” using Web Maker’s Popcorn Maker. The clip I edited reminds me that curiousity and confusion can lead to meaningful learning but sometimes the process is uncomfortable. I am looking forward to exploring more of the unknown next week! Bring on the confusion!